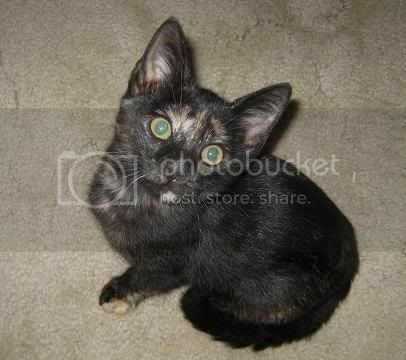 Congrats on the new Kitten, Shas! He missed a couple of his frisbees tonight, but the crowd loved him. He was really cute. You can watch a video of Rory by clicking on the link at the bottom of this post. Los Angeles - A Hoosier canine gave a live performance on America's Got Talent Tuesday night. Rockin' Rory and his best friend Tony Hoard headed to Hollywood last week. They are Indiana's last team competing on the national talent show. Hoard rescued Rory and the two have clicked with their high flying act ever since. The frisbee-throwing/retrieving team has made it through two rounds. Now it's down to the semi-finals. In order to win, Rory will need your votes, so get ready to call in and cast your votes to help our Hoosier team. To vote for Rory, call 1-866-602-4804 or text "vote" to 4804. Rory and Tony will find out if they advance Wednesday night live on Channel 13. This is not my picture. I found it on the Internet and I thought I'd share it with you. 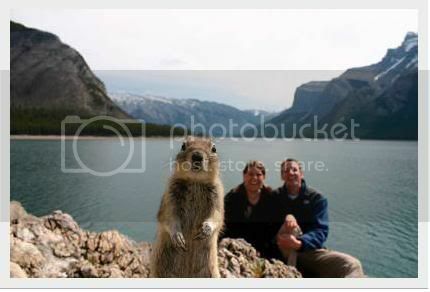 "An attention-hungry squirrel investigating an automatic camera crashes a Minnesota couple's vacation photo in Lake Minnewanka, Canada, Aug. 7. "We were getting ready when this ground squirrel appeared, became intrigued with the sound of the focusing camera and popped right into our shot," Melissa Brandts said. "We were laughing about this little guy for days." "
this story even made it to Swedish newspapers! He swallowed nine golf balls.... and survived! And they found something else in there too while operating on him. Something quite disturbing. You can see his picture by clicking on the link below. He's a real cutie! They say cats have nine lives, but the saying may also hold true for dogs. Or at least it may hold true for Bertie, a pointer cross-breed who swallowed nine golf balls in July and luckily lived to tell -- or should we say wag -- his tail. According to the Telegraph, Bertie's owners Mark and Michelle Jewell often took their dog for strolls through their town of Malden, England. One day, they noticed Bertie's gait looked funny. Concerned, they took their dog to the Clarendon House Veterinary Center, where x-rays revealed an astonishing sight: Bertie had managed to swallow nine golf balls, all of which remained lodged in his tummy. "We were absolutely flabbergasted when we saw Bertie's x-ray," veterinarian Emily Nightingale told the Telegraph. "His stomach could have easily ruptured from the pressure of all of the golf balls, which could have been fatal." As if the golf balls weren't enough, veterinary surgeon John Matthews got another surprise while performing the emergency two-hour surgery on Bertie. The Telegraph reports that buried in the fatty tissue surrounding the dog's stomach was a bullet -- described in one report as an "air rifle" bullet -- which Dr. Matthews also removed. "He had no wounds from the gun shot injury so we suspect he had been shot a long time ago and there is no chance he could have swallowed the bullet as it was outside the stomach," Dr. Nightingale told ZooToo.com. Unfortunately, Bertie's ordeal seems not uncommon. In June, an eight-month old Rottweiler puppy in Boston swallowed eight golf balls, but also luckily survived. As for Bertie, he has rebounded from his surgery on July 27 and scoffed at the idea of changing the spelling of his name to Birdie. To see Bernie's outrageous x-ray, cue the video below to 1 minute 3 seconds. Jeez! He was really lucky. Some dogs gobble down weird stuff . And the bullet is downright mysterious . Oh, the squirrel from a week or so ago made it also into my newspaper . That pic is is too funny. I remember seeing a show where a dog was rushed to the hospital for swallowing a large kitchen knife that a vistor to his owners' house had used to cut chocolate cake, and left lying on the coffee table. The dog survived the ordeal, and according to the owners, the vets were more concerned about the amount of chocolate the dog ingested instead of the knife. That was when I found out that chocolate was poisonous to dogs. How they manage to swallow things and sometimes pass them is beyond me. Once years ago, I was cleaning out the catbox (these were my old cats) and found a bobby pin in one of the poops. Not a little hair pin, but one of the bigger ones. How in the heck one of my cats swallowed the thing and it managed to pass all the loops and twists and coils of her intestines without much discomfort or puncturing something I will never know. Once years ago, I was cleaning out the catbox (these were my old cats) and found a bobby pin in one of the poops. Not a little hair pin, but one of the bigger ones. Holy cow! I can just imagine the shock on your face!